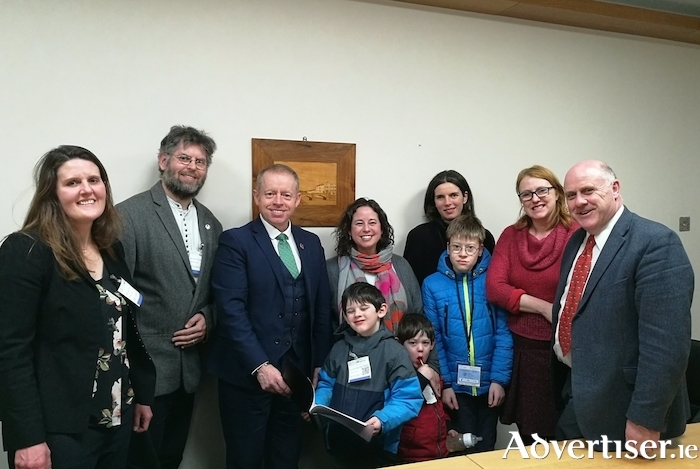 Parents and children from GET2LS meeting with Galway politicians to seek support for an Educate Together Secondary School for Galway. (L-R): Maggie Hall, Andrew Ó Baoill, Minister Ciaran Cannon, Tadhg Ó Baoill, Jodi Blumenfeld, Noah Ó Baoill, Marguerite Hughes, Louis Hughes, Senator Alice-Mary Higgins, Dep Noel Grealish. Despite Galway's continued population growth, the city narrowly missed out on approval for a new second level school during the last capacity review by the Department of Education in 2015. Galway is widely expected to feature in a mid-term capacity review expected to be launched early in 2018. Second-level enrolment data, recently released census data, and current primary-level enrolments predict Galway schools reaching capacity following the September 2018 intake.